[T]he Federal Circuit shall review the decision from which an appeal is taken …. Upon its determination the court shall issue to the Director its mandate and opinion, which shall be entered of record in the Patent and Trademark Office and shall govern the further proceedings in the case. The particular case here is narrow – what exactly is disclosed by the cited prior art – and how a prior art pin assembly is grounded. Truly a narrow issue, but what the oral arguments suggest is that the court did not really understand the technology at issue and instead planned to rely upon the substantial evidence standard of review. 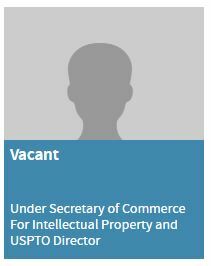 Apart from the two positions that require Senate confirmation (Secretary and Deputy), the only top commerce department position not filled by either an acting chief or appointee is Undersecretary of Intellectual Property and USPTO Director. 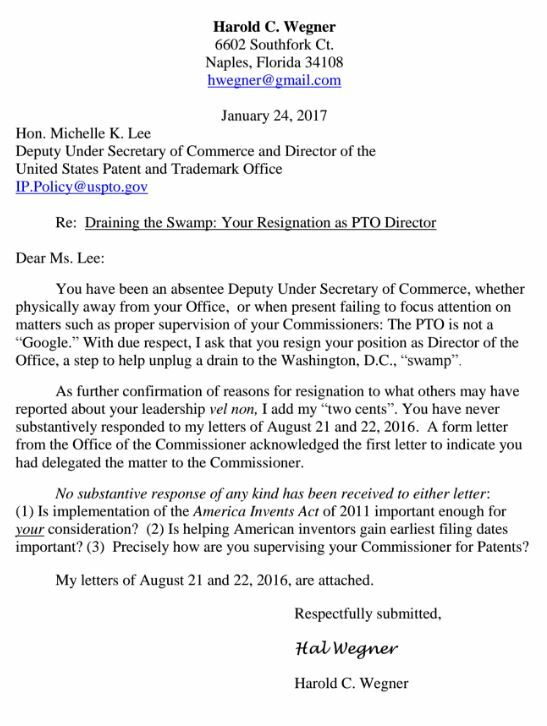 With conflicting media reports and no statement from the USPTO or Department of Commerce, we are left guessing as to whether Michelle Lee continues-on as USPTO Director and Undersecretary of Commerce for Intellectual Property. The Commerce Department leadership has been substantially filled – but the IP position remains blank. My request for clarification from the office have also been denied. I have also submitted a FOIA request, but that process tends to be slow. We will likely have to wait for the Confirmation of Wilbur Ross as Commerce Secretary before stakeholders are informed of the state-of-affairs. I want to give my congratulations and thanks to Michelle Lee, Russ Slifer, and other members of PTO Leadership. The past five years have been a time of tremendous shifting in the patent system led by the legislature (the AIA of 2011) and the Supreme Court (Alice/Mayo). PTO Leadership has offered a stabilizing force with a constant push toward an efficient and high quality system. Many patentees were saved by by the PTO’s intentionally narrow reading of Alice and Mayo and the long-complaint-of backlog of pending cases is substantially reduced. These days I hear two major competing complaints: (1) the PTO continues to issue too many invalid patents and (2) the PTAB is too tough on patentees. It will be interesting to see where we arrive four years from now. If I were a patentee, I would certainly have great concern that the next director may be far worse. Folks are having fun today with Federal Government web page conversions. We still do not have confirmation that Michelle Lee will stay-on as Under Secretary of Commerce for Intellectual Property and USPTO Director. 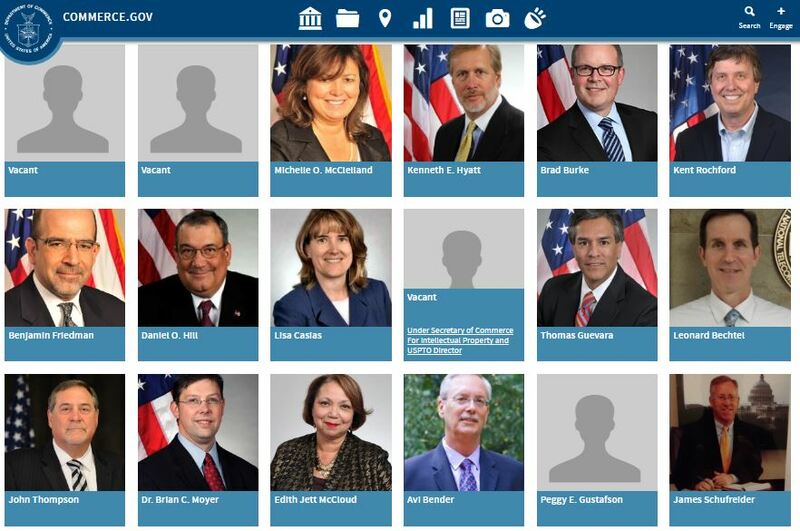 The newly updated COMMERCE.GOV website shows the position vacant while other positions remain filled. It should all be figured out by Monday. If you remember, Dir. Lee’s initial appointment by President Obama was also filled with some amount of discord and confusion a la The Office with her “acting as director” for several months before actually being nominated for the position. Major Crossover Move: Michelle Lee Staying on as PTO Director? The Hill and others are reporting that USPTO Director Michelle Lee will stay on as PTO Director under President Trump. No official statement yet (perhaps because PTO Chief Communications officer Patrick Ross resigned yesterday). 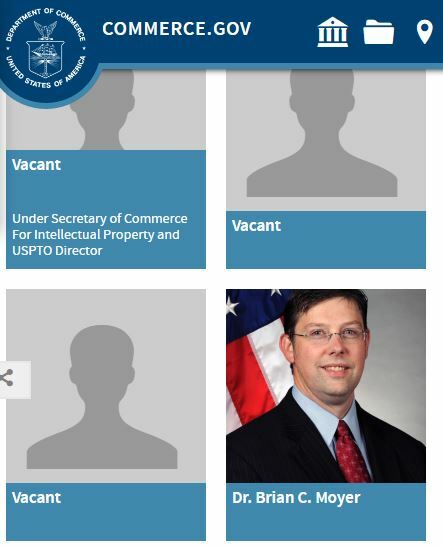 The USPTO only houses a handful of political appointees – Director (Michelle Lee), Deputy Director (Russ Slifer), Chief of Staff (Vikrum Aiyer); and a couple more senior advisors including the Chief Communications Officer (Patrick Ross). These folks will all resign on or before noon on Inauguration Day, January 20, 2017. Through an Agency procedure put in place by former Director James Rogan, Commissioner for Patents (Drew Hirshfeld) will then step-in as acting director. One unlikely potential kink in the tradition is that this is the first presidential transition with competing PTO leaders – namely the four Regional Office directors (John Cabeca, Molly Kocialski; Cristal Sheppard, and Hope Shimabuku) any of whom could step-in as acting director (recognizing that is the pathway taken by Michelle Lee). However, the Regional Directors are really outside of the ordinary PTO chain of command. Recognize that these transitions and traditions are subject to immediate adjustment by the incoming Trump Administration. I would expect significant shake-up in PTO Senior Staff in the coming months: General Counsel, regional PTO Directors, and perhaps Solicitor and PTAB Director. However, every president struggles through how to deal with career federal employees loyal to the efforts of the prior administration. Last week, the United States Patent and Trademark Office released its annual Performance and Accountability Report. 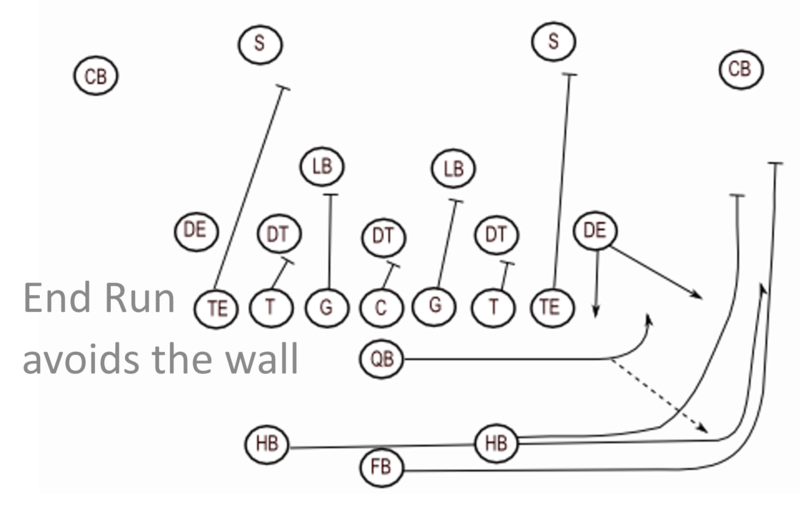 If you’ve never read this document before, I highly encourage giving it a look. It’s chock-full of information on the PTO, from summary overviews to financials to performance metrics to changes in agency operation. There’s also an extensive set of tables with tons of data for those who like that kind of stuff. Law students and junior attorneys who want to quickly get up to speed on the PTO, in particular, can obtain a lot of information about the agency from the PAR. But there’s something in there for everyone. 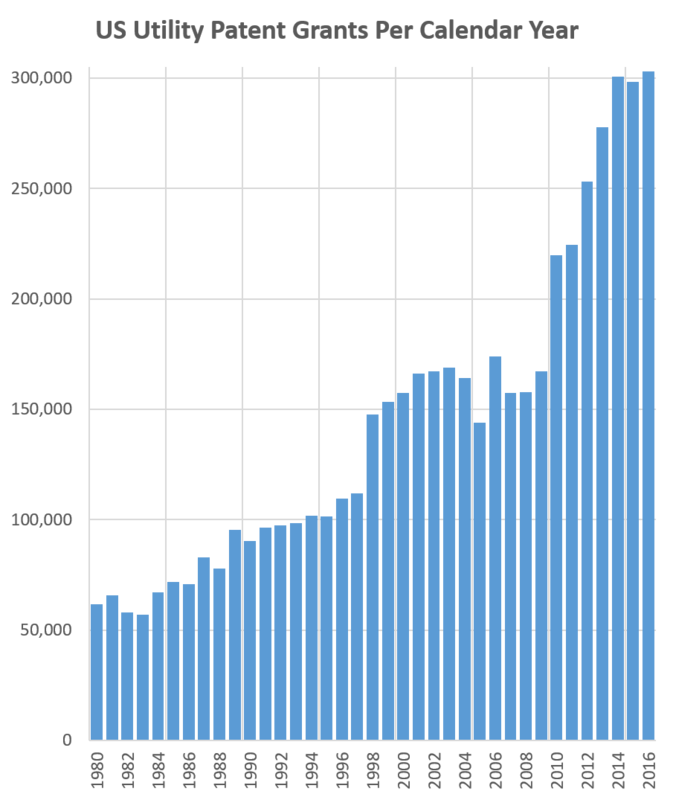 The chart below shows the number of utility patents granted each year for the past few decades. I have included images of PTO chiefs as well. Although only small view of PTO work-product, the dramatic shifts in the number of grants (all occurring while facing a large backlog of cases) helps highlight the importance of the role of PTO Director. You’ll note that more utility patents were issued in 2016 than any prior calendar year – 303,000. However, the rate-of-increase seen under Dir. Kappos is clearly gone. Non-animated version to the right. Directors shown are Q.Todd Dickenson (1998-2001); Jon Dudas (2004-2009); David Kappos (2009-2013); and Michelle Lee (2014-2017). J.Rogan and the acting directors are not shown. Make Patents Great Again – PTO Speculation: Judge Rader? Judge Rader is a longtime member of the court and has been a gregarious Chief Judge. His willingness to have frank and open discussions on a variety of patent law issues has been welcomed by the bar as has his work to build ties with patent law authorities from around the globe. Those connections will continue to serve the court well into the future. However, this outgoing approach has also been criticized as contrary to the traditions of judicial detachment and seclusion. Judge Rader has the patent law and political expertise to do this job — question whether he would really want to run a 10,000 person organization. Rader likely has strong support from President Pro Tempore of the United States Senate Orin Hatch. In my mind, the other leading candidate is Phil Johnson. The PTO directorship would serve as a capstone to a truly incredible career. Trump and his team have substantial trademark experience, and so an internal dark-horse candidate is always likely. Because of her ties to the Obama Administration, I see it as highly unlikely that current PTO director Michelle Lee would be asked to stay-on even temporarily in that position. PTO Director wears many hats, but I see the primary job as leading the 10,000+ examiners and judges to ensure a high quality work product at a reasonable cost and speed. Patent and trademark experience are certainly necessary – but I would think it is also important to have experience or understanding of managing such a large workforce of unionized employees. Congratulations to Harold McElhinny on his retirement from MoFo; he has apparently refused calls from Trump Tower. The AIPLA letter to director Lee is here. First, I’m not sure the USPTO has power to do this. Whether or not there is privilege turns, under Fed. R. Evid. 501, on federal common law, federal statutes, or the Constitution, not agency rule-making. Second, the scope of the privilege is a quagmire. The problem is that the scope of privilege, at least so far as the Federal Circuit in a 2-1 panel decision in Queen’s University (and other courts) has said, turns on the scope of authority of patent agents. So, a patent agent who, for example, emails after a patent has issued about, say, its potential infringement: no privilege. For now, and I would say even after/if the USPTO adopts a rule, be very careful if you have patent agents communicating directly with clients, without supervision of a lawyer, because there’s also the possibility that a court won’t follow the Queen’s University case and hold there is no privilege, anyway. That’s already happened in Texas. Guest Post: Can an Inventorship Be Challenged in a PGR Proceeding? The enactment of the AIA brought several changes to processes for correcting and challenging inventorship. Perhaps most notable were the elimination of 35 U.S.C. § 102(f) and the replacement of interference proceedings with derivation proceedings. These changes have raised several questions on the implications of improper inventorship in a post-AIA patent. See, e.g., Crouch, With 102(f) Eliminated, Is Inventorship Now Codified in 35 U.S.C. 101?, Patently-O (October 4, 2012). Of the many questions yet to be addressed, one is whether an allegation of improper inventorship can be raised in a Post Grant Review (PGR) proceeding. The PTAB recently had a chance to address that question when it ruled on the first ever PGR petition filed against a design patent. Galaxia Electronics Co. v. Revolution Display, LLC, PGR2016-00021, paper 11 (PTAB November 2, 2016). In deciding not to institute trial, the PTAB also made the first ever decision on an alleged inventorship error in a PGR proceeding. However, the PTAB chose to not address the fundamental question of whether an alleged error in inventorship is a statutorily proper ground for institution of a PGR and instead denied institution by deciding the Petitioner failed to present adequate evidence to support its allegation. While this may have been the judicially expedient way to resolve this specific petition, sooner or later the PTAB is going to have to deal with the question of whether inventorship challenges should be grounds for PGR. When it does get to that question, the PTAB should decide there is no place in a PGR proceeding for inventorship challenges. A PGR trial cannot be instituted unless the information in a petition demonstrates that it is more likely than not that at least one challenged claim is unpatentable. See 35 U.S.C. 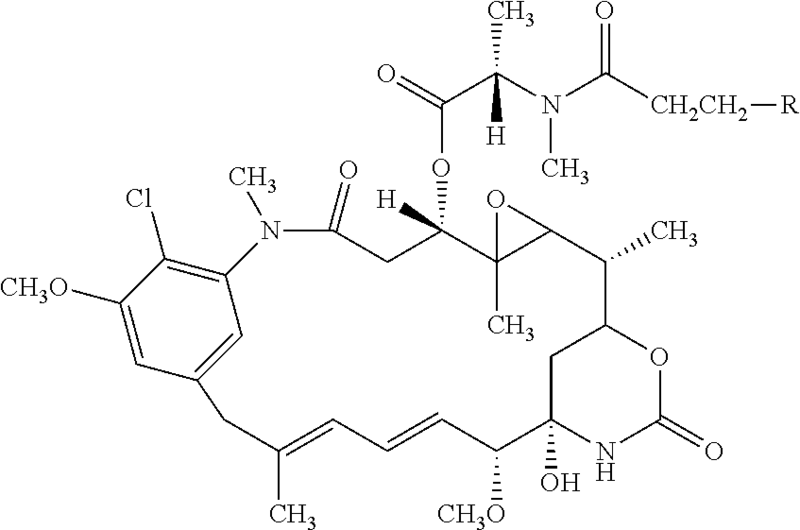 § 324; see also 37 C.F.R. § 42.208. Even before the AIA, however, an allegation of improper inventorship typically did not result in invalidation. See Viskase Corp. v. American National Can Co., 261 F.3d 1316, 1329 (Fed. Cir. 2001) (“Absent fraud or deceptive intent, the correction of inventorship does not affect the validity or enforceability of the patent for the period before the correction.”); see also 1-2 Donald S. Chisum, Chisum on Patents § 2.03 [a] (Matthew Bender) (“Misjoinder and nonjoinder [of inventors] have long been viewed as ‘technical’ defects, not to be favored as objections or defenses to patent rights.”). The reason being that, despite 35 U.S.C. § 102(f) (pre-AIA), inventorship could be corrected in most instances under either §§ 251 (“Reissue Of Defective Patents”) or 256 (“Correction Of Named Inventor”). A limited pre-AIA exception where inventorship could not be corrected was if a movant could not demonstrate the error arose without deceptive intent. See, e.g., Pannu v. Iolab Corp., 155 F.3d 1344, 1350 n.4 (Fed. Cir. 1998) (noting the requirement of showing the error occurred without deceptive intent, but also that “good faith [was] presumed in the absence of a persuasive showing of deceptive intent”). The AIA removed that limited exception, thereby eliminating any possibility of invalidating a patent based on improper inventorship, assuming at least one of the owners is willing to make corrections deemed necessary. Specifically, besides eliminating § 102(f), the AIA also amended sections 251 and 256 by removing the “without any deceptive intention” requirement from those two sections. While commentators have questioned whether that pre-AIA requirement had any practical effect, see Chisum § 2.04[d], the amendments to sections 251 and 256 make it clear that any demonstrated inventorship error can be corrected; either by a certificate of correction, a reissue application, or by a suit under § 256 in Federal court. See, e.g., Vapor Point, LLC v. Alford, 832 F.3d 1343, 1348 (Fed. Cir. 2016) (ruling on an action to correct inventorship brought under § 256). Admittedly, in situations where a party has raised an inventorship issue in a PGR, it is unlikely that all alleged inventors would be willing to cooperate with the patent owner. But this still is not a stumbling block to correction of inventorship because cooperation of all inventors is not necessarily required. As noted in MPEP § 1481.02(I), in the event an inventor is unavailable or uncooperative, a patent owner can still obtain correction via reissue. See 37 C.F.R. §§ 1.175, 1.64; see also MPEP § 1412.04(II) (“Reissue As A Vehicle For Correcting Inventorship”). Further, the patent owner may establish the right to take action pursuant to procedures described in MPEP § 325. To the extent there was a legitimate dispute as to ownership affecting entitlement toact, that dispute is separate from inventorship and a matter governed under state law—a matter that simply cannot be resolved by the PTAB or anyone at the USPTO. See, e.g., Ethicon, Inc. v. U.S. Surgical Corp., 135 F.3d 1456, 1471 (Fed. Cir. 1998). There is a further, practical problem to permitting inventorship challenges in a PGR. If the PTAB were to institute trial on that ground (alone or among others), nothing would appear to prevent the patent owner from admitting the error and filing a reissue application or § 256 court action to correct it. It would then seem that fundamental due process considerations should allow the patent owner to correct a correctable error. But the PTAB may not be able to wait to see if inventorship is corrected before ruling in the PGR because it is statutorily obligated to reach a final determination within 12-18 months of instituting trial. 35 U.S.C. § 326 (a)(11). Based on the current backlog of reissue applications and other matters before the Central Reexamination Unit (CRU), it is unlikely that a reissue application could reach final disposition within the 12-18 month time period. The USPTO would thus seem to be stepping into a quagmire if it does not eliminate inventorship error as a ground for PGR—a patent owner has a right to pursue correction of inventorship, yet the PTAB is obligated to reach a final decision before that correction can be effected. On the other hand, if inventorship challenges before the PTAB are limited to Derivation proceedings, which are not statutorily mandated to be completed within a specific time frame and also contemplate correction of inventorship as a possible outcome (35 U.S.C. § 135(b)), that potential quagmire is avoided. So even if, despite the elimination of § 102(f), inventorship can still be challenged under 35 U.S.C. §§ 101 or 171, such a challenge is not a statutorily proper ground for institution of a PGR because such a petition cannot demonstrate that it is more likely than not that at least one challenged claim is unpatentable. And such a ruling would comport with the statutory-framework of the AIA—Congress created Derivation proceedings, the replacement for Interference proceedings (35 U.S.C. § 135 (pre-AIA)), as the sole proceeding before the Board for inventorship challenges to post-AIA patents. See 35 U.S.C. § 135; see also 37 C.F.R. § 42.401 et seq. Thus, inventorship challenges can still be brought before the PTAB, it is simply a matter of choosing the correct vehicle through which to do so. While the PTAB chose not to address this issue this time, when next raised, it should decide the Derivation proceeding is the sole process to bring such a claim before the Board. But until the PTAB rules definitively that inventorship error is not a ground on which PGR may be based, it is our view that failure to raise that ground in a petition will most likely lead to an estoppel on the issue. See 35 U.S.C. § 325 (e). Thus, for now, any PGR petitioner that thinks it might have a possible basis for challenging inventorship better raise that ground in its PGR petition or risk being estopped from later challenging the patent on that basis. Tom Kohler and Kevin McGrath are director and associate, respectively, at Downs Rachlin Martin, PLLC which represented the Patent Owner in Galaxia Electronics Co. v. Revolution Display, LLC, PGR2016-00021 (PTAB May 18, 2016); the first PGR petition directed to a design patent. Today, USPTO Director provided her first Post-Election speech that includes some thoughts on IP policy after Obama. I believe the incoming administration must and will continue our effort to promote innovation fueled by a strong and robust IP system. Support for IP in the United States has a long history of bipartisanship, and there’s no reason to imagine that changing with a new president and a new Congress, both of whom have economic growth as a top priority. . . .
I’m optimistic the incoming administration will share our appreciation of the importance of intellectual property as a driver of economic growth. As I look ahead, I foresee legislative patent reform changes will continue to be discussed in Congress, though those conversations will likely occur later in the term after some of the other priorities including filling a Supreme Court vacancy, immigration and tax reform are addressed, and any legislative patent reform will likely be more targeted, rather than the comprehensive reforms we’ve seen in prior Congresses. I would hope any legislative proposal will take into account the numerous positive changes that have occurred recently in the patent system including: through the courts, including on attorneys fees, pleading requirements and discovery limits, and at the USPTO through the PTAB and the agency’s efforts to improve the quality of patents in our system. As far as issues, I predict legislative discussions may include venue reform and possibly changes to Section 101 and PTAB. On venue, with nearly half of the patent cases filed in 2015 filed in a single district out of 94 federal judicial districts, it is easy for critics to contend that plaintiffs seek out this district preferentially for the wrong reasons. And the mere perception that there are advantages to be gained by forum-shopping challenges the public’s faith in the patent system. So there will be continuing pressure for legislative (and likely judicial) action on the issue of venue. The scope of any legislative reform remains is to be determined, but I predict that the focus will be on more targeted, rather than comprehensive reform as we saw these past couple Congresses. Further, I anticipate that the USPTO’s work across the globe to ensure that other countries have strong IP protections adequate enforcement mechanisms and remedies, and appropriate technology transfer (or licensing and competition) policies, will continue in the next Administration particularly in such countries as China and others. This is a President-elect that has promised economic growth and job creation in our country, and IP will necessarily be a key piece to achieving that goal. . . . I firmly believe that the USPTO is healthy, well-functioning and poised to successfully handle whatever challenges and opportunities lie ahead. . . . When President Obama was inaugurated in 2009, his focus was on leading this nation’s recovery from the Great Recession. One of his first acts was to ask the Smithsonian to provide for display in the Oval Office some patent models that demonstrated past American innovation that led to new jobs and new industries. The president said that throughout our history, Americans solved problems through innovation and IP. He wanted to see reminders of that every day as he encountered the challenges he faced. The Smithsonian provided him with three models: Samuel Morse’s telegraph (1849), John Peer’s gear cutter (1874), and Henry Williams’ steamboat wheel (1877). As I stood behind the President in the Oval Office earlier this year when he signed the Defend Trade Secrets Act, I couldn’t help but notice those three models along the wall to my left—still there almost eight years later—and feel extraordinarily humbled and honored. I feel that same honor and humility today standing before all of you and reflecting on just how much we have accomplished under this administration. I’ve been fortunate to lead the USPTO at a time when intellectual property issues have been front and center on the consciousness of the American public and President and to have had the opportunity to help guide the direction in a small way. My hope is that the President-elect keeps the patent models from Morse, Peer and Williams in his office as a reminder of the importance of intellectual property to the economic prosperity that I know he wants for our country.